Preheat oven to 180°C. Line a baking sheet with parchment paper. Arrange the naan/flatbread on the baking sheet and lightly spray or brush with water. Set aside. Heat the olive oil in a medium pan over medium low heat. Add the onion and season with a pinch of salt to taste and red pepper flakes. Cook the onions until it is wilted, about 3-5 minutes and stir in the honey, letting the onions caramelize. Remove from heat. While the onions cook, stir the ricotta and feta cheese in a small bowl. Spread the ricotta mixture over the naan/flatbread, and top with the honey caramelized onions. Sprinkle the blueberries on top. 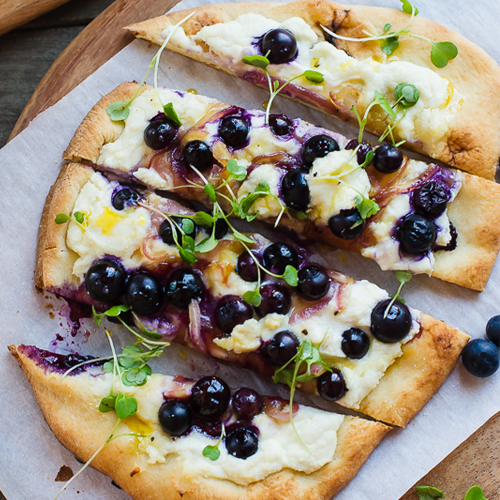 Place the naan pizzas into the oven and bake for about 10 minutes, or until the blueberries are just about ready to burst, the cheese has softened, and the naan is toasted. Remove from oven, sprinkle with rocket and enjoy immediately. Spray the insides and rim of the jars and place them on a baking sheet. In a medium bowl, combine all of the ingredients for the filling. 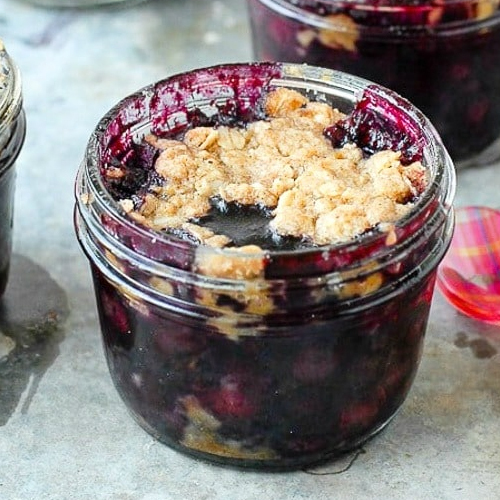 Spoon the filling into the jars, using the back of a mixing spoon to press blueberries down if needed to allow about ½ inch for the topping. Note: the filling will compress when cooking. In a separate bowl, combine all of the ingredients for the topping. Spoon the topping evenly across the four jars, distributing across to the top of the filling to cover it. Place baking sheet with jars in the preheated oven and bake for 30 minutes or until the filling is bubbly and the tops are lightly golden in colour. Preheat oven to 190c. Line a 22 x 12cm loaf pan with parchment paper or lightly butter and dust with flour. 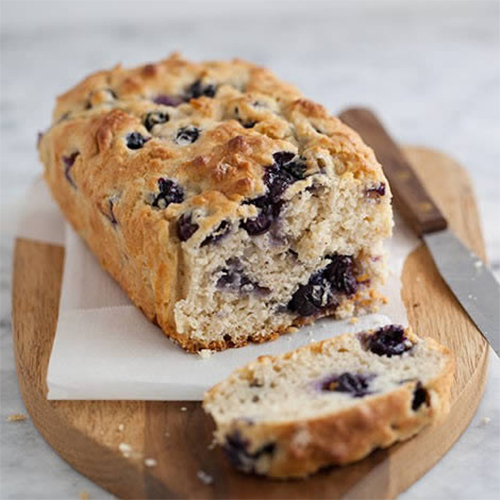 In a small bowl, toss blueberries with 1 tablespoon flour to keep blueberries from sinking. In a large bowl, whisk 2 cups flour, sugar, baking powder and salt. In a separate bowl, mix yogurt, eggs, melted butter and vanilla together and then fold into the dry ingredients. Add the blueberries and oats and gently combine. Scrape the mixture to loaf pan. It will be thick and a little sticky. Bake for 50-55 minutes and golden brown and when a toothpick inserted into the bread comes out clean. Remove from oven and cool in the pan for 5 minutes then cool on a wire rack. Serve warm or at room temperature. In a large bowl, combine water, yeast, honey and olive oil. Mix with a spoon, then let sit until foamy, about 10 minutes. Add in 2 cups flour and salt, stirring with a spoon until the dough comes together but is still sticky. Using your hands, form the dough into a ball and work in the additional 2/3 cup flour, kneading it on a floured surface for a few minutes. Rub the same bowl with olive oil then place the dough inside, turning to coat. Cover with a towel and place in a warm place to rise for about 1-1 1/2 hours. While the dough is rising, heat a large skillet over low heat and add olive oil and butter. Add in the shallots and the salt and cover, cooking for 30 minutes and stirring occasionally and reducing the heat more if they begin to brown too much. Stir in the brown sugar and the garlic and cook for 5 more minutes. Set aside. Add the ricotta to a food processor and blend until smooth. Add in the lemon zest and puree until combined. After the dough has risen, punch it down and place it back on the floured surface. Using a rolling pin or your hands, form it into your desired shape (sometimes I use baking sheets and do rectangles or free form pizzas - this specific dough will yield one pizza large enough to feed about 3-4 people) and place on a baking sheet or pizza peel. Place the towel back over the dough and let sit in the warm place for 10 minutes. Preheat your oven to its hottest setting (usually 220C) - or if you're using a pizza stone, follow the manufacturers directions. Spread the ricotta on the dough and cover it with half of the mozzarella. Add the shallots and the thyme, then cover it in the blueberries. Add the remaining cheese. 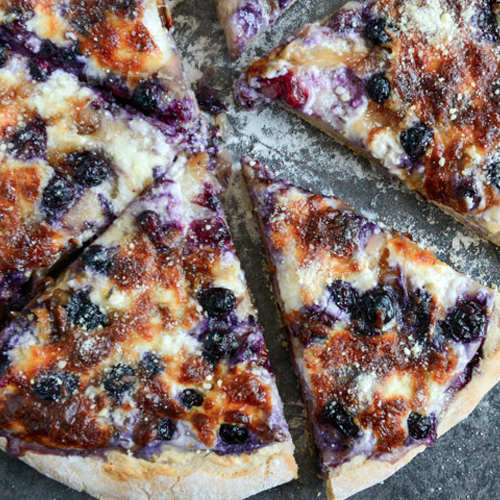 Bake for around 20 minutes, or until the crust is golden and the cheese is bubbly. (Time will vary a lot depending on oven, so allow up to 30 minutes) Remove and serve with parmesan on top.